This report card reveals the paths banks have taken since the Paris Agreement was adopted, and finds that overall bank financing continues to be aligned with climate disaster. The findings show that U.S., Canadian, Chinese, European, and Japanese banks have financed fossil fuels industries continuously with financing on the rise each year. JP Morgan Chase (U.S.) has dominated the lending by a wide margin. 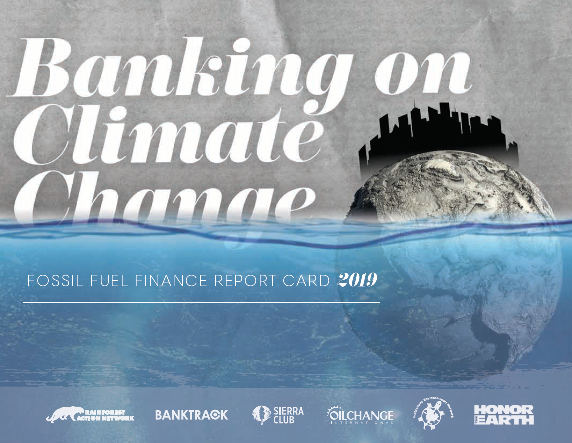 The Banking on Climate Change 2019: Fossil Fuel Finance Report Card summarizes effects the lending industry has on the fossil fuel system. The short version of the Report is available below and on the website found here. The long version is available in PDF here. Last October, the Intergovernmental Panel on Climate Change (IPCC) released a sobering report on the devastating impacts our world will face with 1.5° Celsius of warming – let alone 2°C – while setting out the emissions trajectory the nations of the world need to take if we are to have any shot at keeping to that 1.5°C limit. This 10th annual fossil fuel finance report card has been greatly expanded in scope. The report reveals the paths banks have taken in the past three years since the Paris Agreement was adopted, and finds that overall bank financing continues to be aligned with climate disaster. Adding up lending and underwriting from 33 global banks to the fossil fuel industry as a whole reveals stark findings: Canadian, Chinese, European, Japanese, and U.S. banks have financed fossil fuels with $1.9 trillion since the Paris Agreement was adopted (2016 to 2018), with financing on the rise each year. Fossil fuel financing is dominated by the big U.S. banks, with JPMorgan Chase as the world’s top funder of fossil fuels by a wide margin. Also examined are the banks’ support for 100 top companies that are expanding fossil fuels, given that there is no room for new fossil fuels in the world’s carbon budget. Banks continued to support these companies with $600 billion in the last three years. This report also grades banks’ overall future-facing policies regarding fossil fuels, assessing them on restrictions on financing for fossil fuel expansion and commitments to phase out fossil fuel financing on a 1.5°C-aligned trajectory. While some banks have taken important steps, overall major global banks have failed to set adequate trajectories for dealing with the climate crisis. Tar Sands Oil: RBC, TD, and JPMorgan Chase are the biggest bankers of 30 top tar sands producers, plus four key tar sands pipeline companies. Arctic Oil and Gas: JPMorgan Chase is the world’s biggest banker of Arctic oil and gas by far, followed by Deutsche Bank and SMBC Group. Ultra-Deepwater Oil and Gas: JPMorgan Chase, Citi, and Bank of America are the top bankers, but none of the 33 banks have policies to proactively restrict financing for ultra-deepwater extraction. Fracked Oil and Gas: Financing is on the rise over the past three years, and Wells Fargo and JPMorgan Chase are the biggest bankers of fracking overall. In particular, they support key companies active in the Permian Basin, the epicenter of a climate-threatening global surge of oil and gas production. Liquefied Natural Gas (LNG): Banks have financed top companies building LNG import and export terminals around the world with $46 billion since the Paris Agreement, led by JPMorgan Chase, Société Générale, and SMBC Group. Coal Power: Coal power financing is also led by the Chinese banks – Bank of China and ICBC in particular – with Citi and MUFG as the top non-Chinese bankers of coal power. The human rights chapter of this report shows that as fossil fuel companies are increasingly held accountable for their contributions to climate change, finance for these companies also poses a growing liability risk for banks. The fossil fuel industry has been repeatedly linked to human rights abuses, including violations of the rights of Indigenous peoples and at-risk communities, and continues to face an ever-growing onslaught of lawsuits, resistance, delays, and political uncertainty. The IPCC’s recent report on the impacts of a 1.5°C increase in global temperature shows clearly the direction the world needs to take, and the emissions trajectory we need to get there. Banks must align with that trajectory by ending financing for expansion, as well as for these particular spotlight fossil fuels – while committing overall to phase out all financing for fossil fuels on a Paris Agreement-compliant timeline.